UBC-Gavia is a portable, self-contained robotic submersible capable of oceanographic surveys and mapping over several kilometers. At the surface communication with the AUV is by wireless, Ethernet, or Iridium satellite phone, however, underwater communication is limited to acoustic tracking, so missions must be pre-programmed prior to the dive. Powered by a stack of Li-ion rechargeable batteries and a single aft propellor, the torpedo shaped UBC-Gavia is capable of maintaining 2-4 knot cruising speed over 3-4 hours, giving her a range of 15-20 km underwater. At the surface UBC-Gavia accurately fixes her position using a GPS, but once she dives underwater where GPS satellite signals cannot penetrate she determines her position and velocity using an internal navigation system. UBC-Gavia’s core underwater navigation system uses an advanced dead-reckoning calculation to determine her current position and trajectory from her last known position based on her depth, altitude above bottom, speed over bottom and compass bearing. The basic navigation system can be supplemented with a long-baseline (LBL) system, consisting of moored acoustics transponders which enable her to very accurately triangulate her position over a range of approximately 1 km to within a small margin of error, usually less than a few meters. Using this navigation suite, UBC-Gavia is able to follow complex pre-programmed paths, including line transects, lawnmower surveys, or any combination of joined line segments. In the vertical UBC-Gavia is capable of flying at constant depth using her precise pressure sensor (+- 5 cm), or maintaining a constant altitude off bottom using bottom-tracking sonar. UBC-Gavia’s forward-looking Obstacle Avoidance Sonar (OAS) enables her to detect obstacle in her path and maneuver around them. A Seabird 49 Fastcat conductivity-temperature-depth sensor is mounted at the front of the vehicle to measure these parameters in undisturbed water. The CTD is the essential tool for determining the precise physical properties of water, as variation in salinity (calculated from conductivity), temperature and density will determine the flux of heat, salt and energy in the water. The Fastcat CTD is capable of collecting data at 16 Hz meaning at typical cruising speeds a data point approximately every 10 cm. An upward looking 1200 kHz RDI Workhorse Acoustic Doppler Current Profiler (ADCP) measures current velocity of the water column above the vehicle, and a downward looking 1200 kHz RDI Doppler Velocity Logger (DVL) (which is really just another ADCP) tracks the vehicle velocity over bottom. The instruments transmit an acoustic pulse that reflects off acoustically opaque material in the water column (such as plankton or suspended sediments) or off the bottom, and distance to the object can be calculated from the time lag and the relative velocity of the object can be determined from the Doppler shift (objects moving toward the sensor will reflect a higher-frequency sound wave, objects moving away will reflect a lower-frequency sound wave). The 4 sensors on each ADCP/DVL allow velocities to be measured in 3-dimensions (i.e. horizontal and vertical). A Wetlabs Eco Triplet BBFL2 optical backscattering meter measures chlorophyll-a fluorescence, Coloured Dissolved Organic Matter (CDOM) fluorescence, and turbidity (red wavelength scattering). These parameters are used for ecological characterization of the aquatic environment. 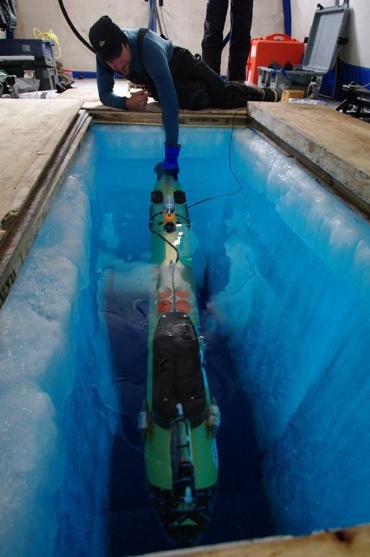 An Imagenex dual frequency 220/990 kHz side-scan sonar unit allows acoustic mapping of the sea-bottom, or ice surface if the AUV is flown inverted. The sidescan emits acoustic beams from either side of the vehicle that reflect off the bottom, depending on the acoustic reflectivity of the material (hard rocks being highly reflective, soft mud less reflective) and the orientation of the object an acoustic map of the substrate and topology is created. The sidescansonar has a combined beam angle of 120o thus it is capable of mapping a swath approximately 60 m wide if the vehicle flies at 30 m altitude. A downward looking high-resolution digital camera and strobe light collects images of the bottom. The camera frame rate is 4 Hz, so overlapping images of the bottom can be stitched together to create a visual mosaic of the bottom, analogous to aerial or satellite photography. The camera has a 45o angle of view so it is capable of collecting 3 m x 3 m images if the vehicle flies at 3 m off bottom, depending on optical clarity of the water.